When a city, school or county issues bonds without a municipal advisor on the financing team, the issuer has no one on its side of the table solely representing its best interests regarding the financial aspects of the bond issue. It is critical to understand that the investment banker/bond underwriter has its first allegiance and duty to investors, not the issuer. As a result the bankers are obliged to design the bond issue to first meet investor preferences, and only secondarily to shape the issue to meet the issuer’s best interests. This set of circumstances causes a potential conflict of interest as depicted in the graphic below. The advisor has a fiduciary duty imposed by the Securities and Exchange Commission to put the issuer’s interest ahead of its own, and all others, which means the advisor must ensure that all aspects of the bond issue favor the issuer. Naturally there is a balance that must be struck between investor interests and those of the political subdivision, but without an independent advisor on board, the finance officer is left without any independent advice on what that balance should be. Examples of details that must be balanced between investor and issuer best interests include call features, couponing structure and underwriter compensation. 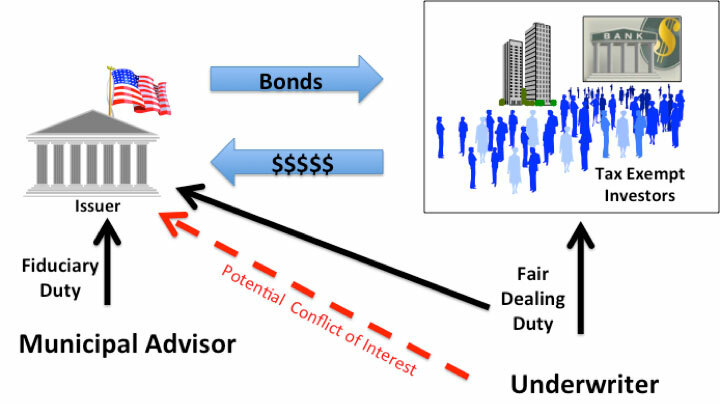 As mentioned above, the advisor has a fiduciary duty imposed by the Securities and Exchange Commission to put the issuer’s interest ahead of its own, and all others, which means the advisor must ensure that all aspects of the bond issue favor the issuer. Call features – short call features provide better future flexibility for the issuer. Naturally investors want longer calls. Typically the issuer is not in a position to accurately assess the cost/benefit of shorter call features. Premium bonds vs. discount bonds - with historically low interest rates, the couponing structure of bond issues varies widely. A school treasurer is in no position to assess whether the coupon structure suggested by the underwriting firm is the best available in the market, nor whether the suggested structure is in the best interest of the school district. An independent advisor has detailed knowledge of current market conditions and will be in position provide objective advice the treasurer regarding the effectiveness of the coupon vs. yield structure being suggested by the bankers. Costs of issuance – infrequent issuers are typically not familiar with current, competitive rates for various professional services required to complete a public debt issue. A well-qualified advisor that is in the market with a variety of issues on a regular basis is aware of competitive fee levels and can advise accordingly. A well-qualified advisor will be available during the pricing period and ensure that the issuer can follow the order flow for the bonds as they come in across the order screen. Without independent interpretation of how the orders are being filled, as well as the status of orders at the end of the order period, the issuer is in no position to determine whether the orders are being filled effectively. At the same time, after the initial order period is completed, the underwriter’s trading desk will very likely want to make adjustments to the initial interest rates and/or the serial and term bonds structure of the bond issue. Without the oversight and input of the independent advisor, the issuer is left to accept the trader’s suggestions without any comparable market information as to whether the final structure is the most advantageous.